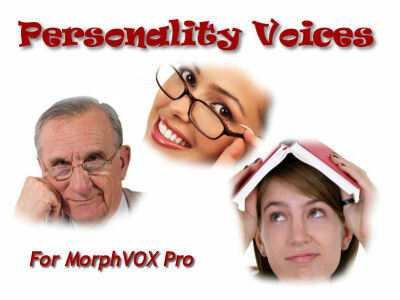 Modify your text-to-speech voices with the Personality Voice-Mod. This add-on for ScriptVOX Studio text-to-speech software includes six unique sounding voices. Now any of your TTS voices can sound like old Albert or squeaky Mary Jane and more. Using advance speech morphing technology, you can add more characters to your movie scripts, children stories, documentaries and presentations. Requires ScriptVOX Studio 1.0 or higher to run.